This is an admittedly weird topic, but here's a confession. I just marvel at Harvey's lips. 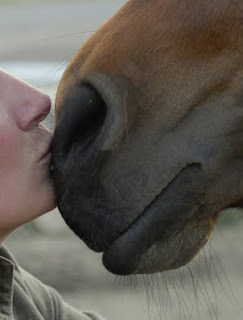 For such big animals, horses have such soft noses and mouths. I love to wiggle Harvey's lower lip while impersonating his voice, and he doesn't seem to mind. I love when horses are dozing and their lower lip droops. It's too cute for words. A horse's lips and mouth have some unique adaptive features. Here are a few facts and links that I found pretty intriguing! Bit fitters have established categories of mouth conformation to assist in bit fitting. Click on the link to identify your horse's mouth type. Horses have a prehensile upper lip. Prehensile means "adapted for seizing, grasping, or taking hold of something." When grazing, a horse's lips actually grasp the grass tips; they curl their lips inward and deliver the grass to their teeth. Below is a picture of Harv, about age 11, with his buddy Wesser. I think they demonstrate the role of lips in grazing very nicely. 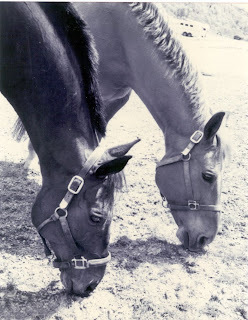 • Linda Tellington-Jones, who is famous for her bodywork with horses, has an article on mouthwork. • There is lip balm for horses! • One sign that a horse could be infected with the West nile virus is twitching or flaccidity of the lips. • Lip smacking is a mild nuisance vice in horses. It's the rhythmical smacking action of the lower lip toward the upper lip when under saddle or in unfamiliar environments. 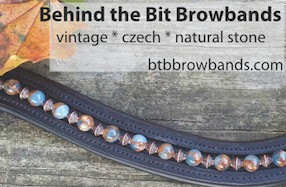 I've often wondered about how horses pick up the lip smacking habit...seen several dressage horses do it at shows while working, as well as a European-trained driving mare who did it constantly, whether she was working or just standing around. Lip balm for horses cracks me up! Cats do the Flehmen response, too! "Lip smacking is a mild nuisance vice in horses. It's the rhythmical smacking action of the lower lip toward the upper lip when under saddle or in unfamiliar environments." Johnny is a chronic lip smacker...I actually think it's kind of funny but it seems to me that he does it most in stressful situations like horse shows or when he is really thinking hard about things (like if there is something scary in the ring) He almost always does it when he's in the cross ties waiting to be saddled....or when he decided to "sing" along to the radio. I love the rubbery sound of horse lip smacking, although done to excess I suppose it could be annoying. But I can tell when Champagne is happy because his upper lip gets sort of square shaped. I have also heard of flemen. Cats do it too, when they smell something they want to savor. Stallions do it when they scent a mare in heat. But I've seen a gelding do it when he smelled bleach! A friend's old trail horse used to flap his lower lip at the trot. It looked like he had a pancake sticking out of his mouth, and was a sign that he was happy and relaxed...but it sure looked silly. On the lip smacking, though, note that it's different if the horse actually moves his lips versus just not holding the bottom one still. I have Tennessee Walking Horses and a lot of them will just not hold their bottom lip up (like the droopy lip when they're relaxed/sleeping), so it smacks against their upper one. Similar things are floppy ears or clacking their teeth together (again, not actively moving them, just not holding them together). It's because they're so relaxed doing what they're doing and nodding their head so much. On the other hand, we do have some "nervous" teeth chompers and lip smackers too! I also love when their lip hangs down AND they drool! We have a horse who does that pretty much all the time. He's an odd duck though. He's extremely nervous and herd-bound, and the absentee owner doesn't really help that... oh well. The conformation link was really interesting - very true in saying my horse's mouth is sensitive! His old owner had him in a rubber snaffle, and while he liked the soft he acted as if it could barely fit in his mouth. I just got him a Happy Mouth french link, and he seems to love the extra space in his mouth - stands and plays with the loose middle pieces with his tongue while waiting for me to be ready to ride. I used to ride a mare who could open her stall door and the doors of all her neighbors in no time. Her lips were very dextrous! I was reading a book to some kindergartners about horses ( my first book about horses type of thing) and the book described horses as animals with prehensile upper lips. Of all the ways to describe a horse that one maybe accurate but not sufficient. Interestingly enough although the first part of this statement calls it a mild nuisance vice, it then goes on to state that it happens in unfamiliar environments - wouldn't that tell you something? Its not a vice or an annoying habit, its a horse telling you that its unsure about the situation its been put in or found itself in!